Altitude range: It is usually found between the altitudes of 900 and 1200 meters. Habitat: The plants occur on rocky slopes and are able to withstand extreme drought and tolerate a fair degree of cold (- 6ºC). Heat is not a problem either, the plants can comfortably tolerate temperatures of (+ 40ºC). The plant is considered threatened in its native habitat. Description: Senecio haworthii also known as Woolly senecio is a perennial dwarf shrub with both stems and succulent leaves covered in densely woven white felt. Possibly the prettiest plant in the genus and better known in cultivation as Kleinia tomentosa. When grown well and kept under glass, with a minimum amount of watering, leaves appear to be pure white. Its first description was written by Adrian Hardy Haworth, in Miscellanea naturalia, 1803, p. 189, with the name of Cacalia tomentosa. Habit: It is a little perennial branched shrub attaining heights of nearly 30 cm tall in cultivation, but is likely to be somewhat smaller in its natural environment. 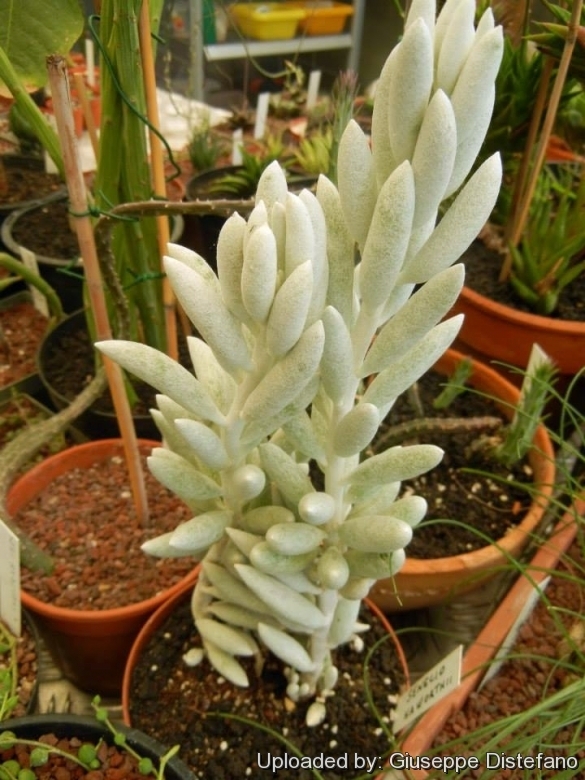 Leaves: Fleshy succulent, upright, imbricated along the stem for many years then deciduous, cylindrical to spindle-shaped, acute at both ends, somewhat obtuse, slightly crenate at the tips, 4 cm long, pure white and stunningly attractive due to the dense silver-white hairs covering all surfaces of the leaves. Inflorescences: Terminal from apex of stem, unbranched and 80-11 mm long with short peduncle bearing yellow flowers. Flowers: Bright yellow to butter yellow rarely seen in cultivation. Cultivation and Propagation: Senecio haworthiiis probably one of the most beautiful of the succulent Senecio. It is relatively easy to grow, and main obvious attraction is that it is nearly pure white, and stands out nicely both as a potted plant and in the landscape. The densely white-felted stems and leaves making a fine contrast among my echeverias, small crassulas and other succulents.Use natural terra cotta (clay) pots to really show this plant off to its full beauty. Like most succulent plants it does not do well in wet soil, but is not in general a demanding garden subject. Growth rate: It is a very slow grower, this plant tends to stay pretty small, growing maybe 30 high in many years given the best conditions. Soil: S. haworthii is opportunistic and will survive in a variety of soils, but does best in a cactus potting mix. Use pot with good drainage. Transplantation: Repotting every 2-3 years. The trick is to be as careful as possible, as the string of pearls falls apart easily. Add some potting mix (compost) to the new container to bring the repotted plant to the correct height. Cautiously upturn the old container, supporting the plant with a gentle hand, position the root ball into the new container, add extra potting mix to fill any empty spaces, and carefully arrange the pearls to hang over the pot. Watering: Water regularly during the growing season every weeks or so, making sure to drench and letting all the water drain out of the pot. Best not wet the foliage and to be kept drier in winter months. In the rest period no high atmospheric humidity!! Care must be taken with watering as they tends to become swollen and untidy in growth habit if given too much water and shade. Fertilization: Use a liquid plant food that is for cacti and succulents rich in potassium and phosphorous, but poor in nitrogen, because this chemical element doesn’t help the development of succulent plants, making them too soft and full of water. Exposure: Plant in an open airy location in full sun or in slight dappled shade including two to three hours a day of direct sunlight through the year, which encourages flowering and heavy leaf production. It do not do well in full shade as it tends to etiolate, and rots easily. Hardiness: Reputedly sensitive to frost , but less so if kept on the dry side prior to, and during, cold weather (hardy to -5° C for short periods). However some warmth throughout the year will increase the grower's success (minimum 5° to 8°C during rest season). It does not like hot weather and needs cool air with ample airflow. Pest & diseases: Just be sure to treat for aphids and mealy bugs if they appear. Rot: It is though to be a fairly easy-to-rot species, but rot it is only a minor problem if the plants are watered and “aired” correctly. If they are not, fungicides won't help all that much. Maintenance: It is advisable to prune the plants back as they become very leggy and unsightly. Propagation: Senecio haworthii hardly ever produces viable seed, but plucked stem, or even a leaf, can be stuck into warm, not-too-dry earth, where it will strike root without special attention. The cuttings should root in 2 to 6 weeks.